About the décor: Restaurateur Shawn Virene’s River Oaks see-and-be-seen eatery boasts a modernistic design of brick and wood with open dining sections and a bar, raw bar and private wine room. It’s named for the village of Bouzy in the heart of France’s Champagne district. Of course, there are bottles of bubbles everywhere, from the end tables to bookcases. Even the hundreds of little glass globes hanging from the ceiling in the main dining room look like bubbles that escaped from Champagne flutes. Likes: House-cured salmon gravlax with a bottle of the Côté Mas Crémant de Limoux Brut Rosé. Dislikes: When the place is crowded (it almost always is) the noise level can be annoying. Food & Drinks: Naturally, you’ll start with a bottle of sparkling wine. Hundreds of options are offered with prices that range from $12 to over $2,000. Plenty of non-sparkling wines are available as well. 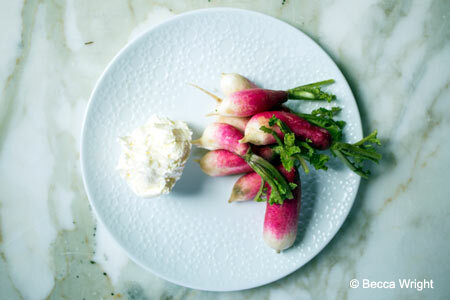 Service stars with a plate of complimentary fresh radishes and whipped herb butter; you can order a bread basket but it costs $5. Starters include the marinated white Spanish anchovies, steak tartare, oysters on the half shell and the instantly famous pommes frites cooked in duck fat. Choose from a delicate and tart lemon sole, thick steaks and a lovely roasted Cornish game hen with a crispy skin. Plenty of salads and raw seafood items make for lighter lunches, and the weekend brunch has a hit with the reasonably priced Grand Slam: two eggs any way, house-cured bacon, grits and potato hash. Peruse the ever-changing dessert menu.